Designed to make learning more interesting and clinically meaningful, this new resource matches radiologic images—including advanced reconstructions—to the exquisite artwork of master medical illustrator Frank H. Netter, MD. 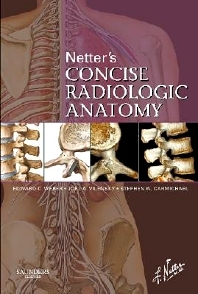 In contrast to all other anatomic/radiologic atlases available, Netter's Concise Radiologic Anatomy begins with the anatomy and matches radiologic images to the anatomic images that are indelibly etched in the minds of those who refer to Netter's Atlas of Human Anatomy on a daily basis. Concise text enables you to quickly and conveniently access the key anatomic and radiologic knowledge associated with the images. Organized and color-coded in the same manner as Netter’s Atlas of Human Anatomy, it’s a perfect companion guide to the Atlas—and a perfect guide for understanding the clinical context of normal anatomy. Presents side-by-side radiology examples of normal anatomy and common variants with corresponding anatomy illustrations, demonstrating the clinical relevance of the anatomy and providing direct, at-a-glance comparisons between idealized anatomic illustrations and real-life medicine. Includes a brief background in basic radiology including reconstructions and a list of common abbreviations to provide a foundation of knowledge for the images presented. Follows the same organization and color-coded format of Netter’s Atlas of Human Anatomy, for easy reference.